Suntour XCM Chainset. Crankarm length: 170mm. Compatible bottom bracket: 113mm (Square Tapered). Chainring combination: 22/32/44T. Chain line: 50mm. Middle ring: Black steel. Finish: Painted white. Shimano Alivio M430/431 Crank Arms. Can be used with 8 or 9 speed systems. black (as pic). Bicycle Chainset. Triple chainset. 170mm Crank Arms. MTB Style : No Chain-guard. 9/16" Pedal thread. Square taper interface. Steel with a Black finish. Shimano FCM131 FCTY701 Chainset. Triple Chainset. Shimano Triple Chainset. Alloy 170mm Crank Arms. Triple Steel Chainrings. Suggested Bottom bracket: 68x 122.5mm. We will always help you to have a 100% positive happy buying experience. MTB / TREKKING Chainset. MTB / TREKKING BIKE. You will receive both sides and crank dust covers. 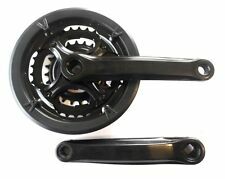 Plastic coated Black 170mm Crank Arms. For a 9/16" Pedal thread. Triple Chainset. Triple Steel Chainrings. Just check the specifications below match your previous chainset. CRANK LENGTH: 170mm. TEETH RATIO: 24 - 34 - 42. DYNAMIC SHAPED TEETH FOR SMOOTHER SHIFTING. CHAIN RINGS: TRIPLE. FITS PEDALS WITH 9/16" THREADS. Bottom Bracket: Octalink. Length: 170mm. Colour: Black. Let Cervus Bike service you! Deore Triple Crankset, altus Shifter And 11-32 9 speed cassette. Cassette came free with a new wheelset and has been barely used, the cogs are off a crankset I'm running a single chainring on now so have barely been used either, I had them in a box so I've put them on an octolink crankset, bottom bracket included. Crank arms have dmr v6 pedals on them. The pedal on the drive side has a rusty hex wrench snapped off in it. I've flattened it off so it won't affect it's function, still has spanner flats on to remove pedal if needed. Pedal isn't stuck. Feel free to ask any questions of for more pictures. Shimano Sora Triple Chainset. 170mm crank . Will clean up before dispatching. Condition is Used. Dispatched with Royal Mail 2nd Class. MTB / Touring Bike Chainset. Triple Chainset - Ratios Available: 24/34/42T. Powder coated Black 170mm Crank Arms. You will receive both sides and Crank Bolts. For a 9/16" Pedal thread. To make sure it fits your bike just check the specifications below match your previous chainset. CRANK LENGTH: 170mm. TEETH RATIO: 24 - 34 - 42. DYNAMIC SHAPED TEETH FOR SMOOTHER SHIFTING. CHAIN RINGS: TRIPLE. Shimano Alloy / Steel Triple Chainset FC-TX801. Complete with 2 Allen Key Crank Bolts. 28/38 /48 teeth ratio. Special teeth profile for easy gear changing. Black plastic chain guard. For square tapered bottom bracket. 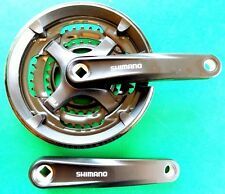 Shimano Alivio FC-M430 9 Speed MTB Bike Square Crank Triple Crankset 22×32×44T. Condition is Used. Dispatched with Hermes Tracked. Please check images carefully as they form part of the description. Length: 175mm. Let Cervus Bike service you! Bottom bracket: Square. Chain Compatibility: 7-8 Speed. Color: Black. Length: 170mm. Let Cervus Bike service you! With Cover. Colour: Black With Silver. 2-piece design double-ring 9-speed chainset from the excellent value Sora range. SG-X chainrings feature strategically placed chain pick-up pins and tooth profiles to ensure fast and positive shifting. 170mm CRANK ARMS FOR 26” & 700 c (28”) WHEEL BIKES. 42 INDEX TEETH ON TOP CHAINRING. 34 INDEX TEETH ON MIDDLE CHAINRING. 24 TEETH ON BOTTOM CHAINRING. This chainset features alloy crank arms for minimal flex and hard wearing steel chainrings. 52-42-30 Steel Chainset. Suspension Units. Right & Left pedal arms included; 170mm length. Profiled teeth to aid shifting. Shimano Deore XT Triple 9 Speed Chainset Fc-m770 175mm. Square taper. 44/32/22t. Good, used condition. Shimano XT FC-M760/761 in a good used condition 175mm Hollowtech Cranks Arms with chainrings, middle ring has been replaced with a Race Face chainring. They have done some work but lots of life left yet. No end screw cap. What you see is what you get. 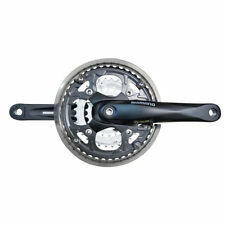 Shimano Sora Chainset FC-R3030 165mm crank length. New, taken unused from a new bike. 50, 39, 30. MTB / TREKKING Chainset. Triple Chainset. Black 42T oute r RING . 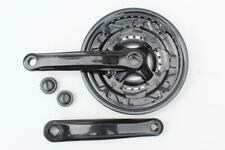 Black Plastic coated Steel 170mm Crank Arms. You will receive both sides and crank dust covers. For a 9/16" Pedal thread. Triple Steel Chainrings. Shimano Alloy / Steel Triple Chainset FC-TX801. Complete with 2 Allen Key Crank Bolts. 28/38 /48 teeth ratio. Special teeth profile for easy gear changing. For square tapered bottom bracket. SIS Index compatible. Shimano Alloy / Steel Triple Chainset FC-TY501. Complete with 2 Allen Key Crank Bolts. 24 /34 /42 teeth ratio. Special teeth profile for easy gear changing. Black plastic chain guard. This chainset features alloy crank arms for minimal flex and hard wearing steel chainrings. 30/42/52 Teeth. Alloy - Polished, Cold Forged Crank. Silver Steel Chainrings. This chainset features alloy crank arms for minimal flex and hard wearing steel chainrings. Alloy / Steel. Bolt Circle:110mm. Black 48T oute r RING . Grey Plastic coated Steel 170mm Crank Arms. MTB / TREKKING Chainset. MTB / TREKKING BIKE. Grey guard. Will fit a 15 / 18 / 21 Speed. Silver 28T & 38T Inner rings. You will receive both sides and crank dust covers. Whatever you're looking for, chances are you can find the right deal on the right wheels, right here. Colour: Black. Your statutory rights are unaffected. Unless arranged otherwise. With Chainguard. Sugino Triple Crankset. 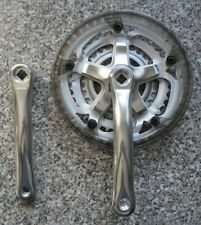 This crankset has been stripped, cleaned and rebuilt. 175mm crank length. 42/32/22 teeth chainrings. Triple chainset with chainguard. 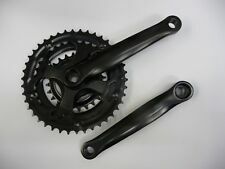 You will receive 2x cranksets 24/34/42t 2x cranksets 28/38/48t. Good quality parts and excellent value for money. 9/16” pedal holes. Profiled teeth for smooth gear changing. 4-arm 44 / 32 / 22T chainring combination. Bottom Bracket compatibility: Octalink. Octalink spindle fit for increased rigidity. 9-speed compatible chainrings. Chainguard: Factory fitted. Replaceable chainrings.